Presently have 205-75R-14 tires on the car and am planning new tires in a month or so. I am looking at 225-70R-14's as replacement tires. Will this be a good replacement/fitment? My 71 Mach has 225/70R14s on factory 14x7 rims. Fit fine, don't rub and don't look like tiny rollerskate wheels. Not a lot of options out there for brands in this size anymore. The Yokohamas I have on their are discontinued. If I were going to replace them with the same size, I'd get Cooper Cobras. You can probably find them for less than tire rack, but you might end up with some old stock that's been sitting in a warehouse for three or more years. (02-09-2019, 12:12 PM)Don C Wrote: Original wheels? Yes, they look like Magnums, or could be a knock-off. They definitely look like Magnums though. The tires, on the other hand, are sort of beat up whitewalls, and probably not original. (02-09-2019, 12:28 PM)Hemikiller Wrote: My 71 Mach has 225/70R14s on factory 14x7 rims. Fit fine, don't rub and don't look like tiny rollerskate wheels. Not a lot of options out there for brands in this size anymore. The Yokohamas I have on their are discontinued. If I were going to replace them with the same size, I'd get Cooper Cobras. You can probably find them for less than tire rack, but you might end up with some old stock that's been sitting in a warehouse for three or more years. I found the Cooper COBRAS at Walmart for $90 each...……...I'll probably go there unless I can find a better deal somewhere else...………. I put the 225/70/14 on my all stock 73. These will be a little bit taller and wider than what you have now which will help fill up the wheel well. The Cooper tires at $90 sounds really good as the TA Radials will be closer to $150. The front of the car has 1" lowering springs while the rear has the Detroit Eaton leafs. You need to make sure what width your wheels are, 225s should go on 7" wide rims. (02-10-2019, 02:24 PM)Don C Wrote: You need to make sure what width your wheels are, 225s should go on 7" wide rims. Thanks Don. What's the best way to measure them? I assume, unless there are numbers on the outside of the wheel, I'll need to remove the wheel and tire and either look for numbers on the back of the wheel, or "eyeball" the width of the wheel with a ruler or tape? 225/70R14 Cooper Cobras are approved for 6" ~ 7.5" rim width. 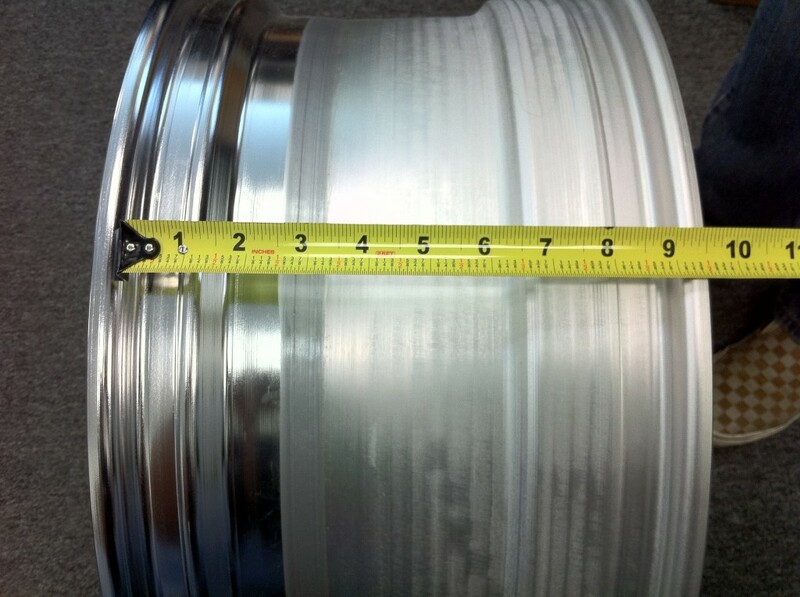 Rim width is measureed **between** the bead flanges, not the outside.